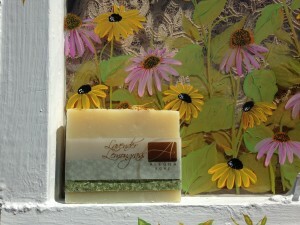 My friend Sharon is an artist and her website is called Ivy Cottage Gifts. 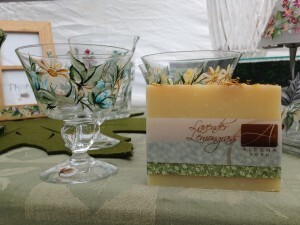 She paints an amazing array of flowers on one of a kind furniture pieces, ceramic and glassware of all kinds. She even does custom orders. I love how she can take an old window and make it into something beautiful, and turn an ordinary wine glass into something truly special. 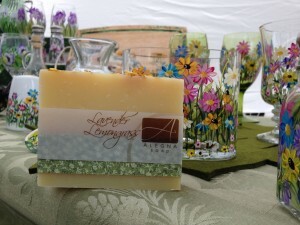 I couldn’t help but put my Lavender Lemongrass soap by her gorgeous products and take some pictures. I think it really goes well with her work, don’t you? Wow, the painted glass is really beautiful. Sharon is such a talented artist. I get to see her work a few times a year when we are at the same shows. At one event we are usually next to each other and she sits and paints salt and pepper shakers. I love to watch her take something so ordinary and make it beautiful. Thanks for commenting Donna.